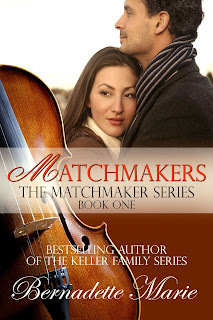 Guest Post: Matchmakers by Bernadette Marie! Steph’s Note: Dear Readers, The Matchmakers series is fabulous and I highly recommend it. Bernadette Marie is a fantastic writer you should definitely check out. Matchmakers: Cellist Sophia Burkhalter thought ten years in Europe performing with an exclusive ensemble would have made it clear that she wasn’t a candidate for her grandmother’s matchmaking. After all, she’d walked away from the man she loved, leaving him back home in Kansas City. Bernadette Marie has been an avid writer since the early age of 13, when she’d fill notebook after notebook with stories that she’d share with her friends. Her journey into novel writing started the summer before eighth grade when her father gave her an old typewriter. At all times of the day and night you would find her on the back porch penning her first work, which she would continue to write for the next 22 years.In 2007 – after marriage, filling her chronic entrepreneurial needs, and having five children – Bernadette began to write seriously with the goal of being published. That year she wrote 12 books. In 2009 she was contracted for her first trilogy and the published author was born. In 2011 she (being the entrepreneur that she is) opened her own publishing house, 5 Prince Publishing, and has released contemporary titles and began the process of taking on other authors in other genres. In 2012 Bernadette Marie found herself on the bestsellers lists of iTunes and Amazon to name a few. Her office wall is lined with colorful PostIt notes with the titles of books she will be releasing in the very near future, with hope that they too will grace the bestsellers lists.Bernadette spends most of her free time driving her kids to their many events—usually hockey. She is also an accomplished martial artist with a second degree black belt in Tang Soo Do. 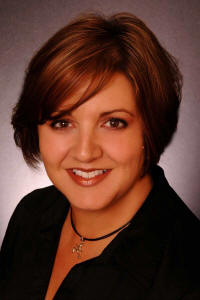 An avid reader, she enjoys contemporary romances with humor and happily ever afters. Sophia filed off the airplane along with the other groggy passengers. The red-eye flight to Kansas City had knotted up her stomach.What in the hell was she doing back here? Perfect persuasion and just the right amount of guilt had gotten her on that plane. Perhaps the tightening of her stomach wasn’t the flying—it could very well be that she’d returned to the very place she’d run from ten years ago. She’d run from a man and shattered the hearts of people she loved. The guilt stung a little deeper. She should have come home years earlier. Sophia followed a small group of women from the plane into the ladies’ room. Exhaustion weighed down her shoulders. Within the hour, she’d be at her grandmother’s house, tucked into her childhood bed, and asleep. In the meantime, she splashed cool water on her face to keep herself alert. She dried her face and hands and adjusted the scarf at her neck to ensure it hid the secret she kept from the world. She picked up the carry-on luggage at her feet and headed toward baggage claim. The husky voice was soft and male and made her knees weak when she heard it. She knew that voice as well as she knew her own. The knot in her stomach returned, but this time it was like a fist in her gut. She turned to see him standing there in his pilot’s uniform with his suitcase at his side—David Kendal, the very man she’d run from so many years ago. He took his pilot’s hat off and revealed the dark, wavy hair that she’d once run her fingers through. It was now speckled with hints of sophisticated silver. His uniform was striking on him—just as it had always been. Even in the early morning hour, she felt her skin tingle when she looked at his broad shoulders and knew what it was like to rest her head against his chest. “David.” His name floated from her lips in a sigh. Ten years had passed since she’d last laid eyes on him, and now he was as large as life standing before her. “I thought that was you on the plane.” He was walking closer to her, and her trembling knees wouldn’t allow her to run the other direction. The scent of his cologne washed over her. His dark eyes were smoky and wide as she watched him take in the sight of her. “Really?” The muscles in her shoulders tensed. She turned from him, head up, shoulders back, and strode toward the elevator, stepping in as the door closed. She leaned her head against the back wall and closed her eyes. How was it possible that after ten years he could stir such feelings in her? Sophia took inventory of what she was feeling. There was a surge of attraction between them. Then the anger she’d felt for years accompanied the thought of him. She’d walked out on him. His betrayal was much stronger than the attraction. It had given her purpose to make something of herself. Her success as a concert cellist sprang as much from her desire to succeed as it did from a need to escape her feelings for David. Sophia opened her eyes when she heard the elevator doors open. The small group of others who had been aboard the plane with her stood watching the empty luggage carousel go around. Sophia waited for her cello case to arrive in the oversized luggage. It killed her to have to check the instrument, but there were no other choices. It was times like this she wondered why she didn’t play the violin. She could carry that onto the plane. Relief flooded her as a man brought her the case. She quickly opened it and examined the instrument to assure herself it had arrived in one piece. Her trip was to last two weeks. She’d wanted to pack only one bag, but against her better judgment, she’d packed two. When the two suitcases dropped to the carousel, she pulled them off and stacked them. One hung from the other, and she slung her carry-on over her shoulder. With a grunt, she hoisted her cello to her side. She started toward the curb to collect a cab. Footsteps clattered on the tile floor behind her. She wouldn’t let herself turn to see him hurrying to her. “I travel like this all the time. I do not need your assistance.” Her voice was cold. “No, you made that perfectly clear when you disappeared and left your engagement ring in the sink.” He kept walking, forcing her to follow. “Where are you going?” She tried to keep up with him, but his long stride kept him a hefty distance ahead of her. “I don’t want you in a cab in the middle of the night,” he said, unwavering from his path. “I know.” He darted a stare in her direction. Thank you for everything! You have been with me since the beginning of EVERYTHING! (literally, huh) And you have helped me in so many many ways! Thank you for sharing in this very special day!